Those who clamber with open eyes through the stone labyrinth of Enkirch’s steep slate slopes are seized by a feeling of thankfulness: a few kilometer’s worth of dry stone walls made up of millions of slate and quartzite stones, both large and small, laid by hand without the aid of transportation, and which link rocky outcroppings and also structure and align the slopes – and make them workable. It is a unique backdrop for a cultural achievement which, perfectly interwoven with the natural landscape, evades in large part repetitiveness and which yields only with great resistance to the continual attention and character of its caretaker. With that comes responsibility, first for the preservation of a singular cultural landscape and also for the use and the growth of the vineyards. A process, a journey of discovery, which is for us part of the estate’s core mission in the coming years. 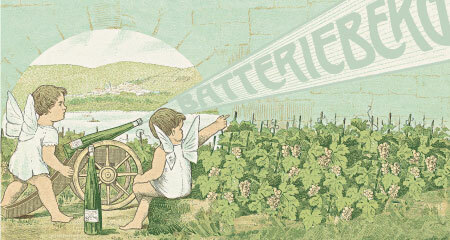 Immich-Batterieberg works four vineyards on extremely steep slopes, all of which were included in the highest class in the Prussian Vineyard Classification of 1868 (based on Napoleon’s Classification des Vines from 1804). Ellergrub, Zweppwigert, and Batterieberg are to be found in a particularly quartzite-rich slate formation, the so-called “Starkenburg Slope”, located between Trarbach and Enkirch. More iron-rich is Steffensberg, which possesses one of the oldest kinds of vineyard demarcation – a pure south-facing slope behind the village of Enkirch itself. Just as important to us as the inherent quality of the vineyards is the available grape material. We are delighted to have a very large portion of old, ungrafted vines, from which, because of their genetic diversity and their naturally low yields, the highly differentiated, deep, and site-typical Rieslings that we want can come into being. 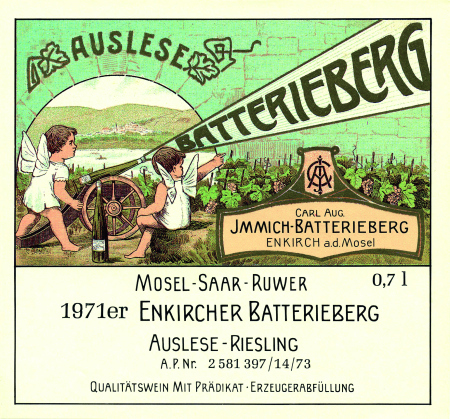 Immich-Batterieberg ranks among the oldest estates on the Mosel. The middle portion of the estate’s grounds – still standing today – was first mentioned, in 908 A.D., by Ludwig IV, the last East Frankish Carolingian king, in a deed that confirmed the estate’s transfer to the church. According to archaeological estimates, the foundation of the building dates from the second half of the 9th century. Especially remarkable is the cellar’s load-bearing basalt pillar, which was “recycled’ from a nearby Roman estate. In the 12th Century the estate was ceded as a fief to Prince von Esch (hence to day’s Escheburg) and was then remodeled and expanded. The right wing of the property, the “Franzenhaus,’ was not built until the 16th Century and the “Herrenhaus,’ richly adorned in the Mosel-Frankish style and which today makes up the left wing, did not appear until the early 1900s. 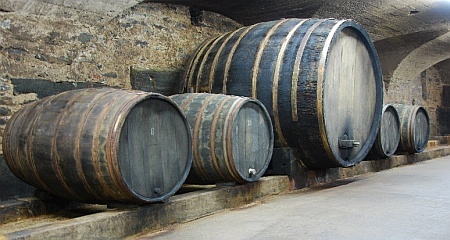 It was the Immich family – among the oldest winemaking families on the Mosel, with a history that spans from 1425 through 1989 – that was especially crucial to the history and the development of the estate. We have them to thank for our most famous site, the Batterieberg, which between 1841 and 1845 was formed into one of the Mosel’s top sites by way of ceaseless rounds of dynamite. 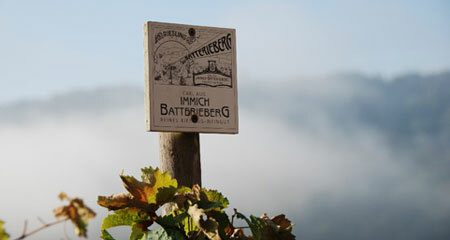 Batterieberg, along with the older top-tier sites Steffensberg, Ellergrub, and Zeppwingert, are all steep slate slopes and all achieved the highest ranking in the Prussian Vineyard Classification of 1868. Today they comprise the heart of the estate. Gernot Kollman hails from Wetter (in Westphalia). 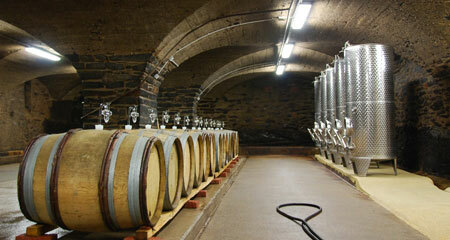 In the early 1990s, at Weingut Dr. Loosen in Bernkastel, he began to transform into a career what had previously been an intensively cultivated hobby. After completing his studies in Wine Business Administration in Heilbronn, and after a brief tenure at the Fürstlich Castell’schen Domänenamt, Gernot worked first at the Bischöflicher Weingüter in Trier and then at Van Volxem on the Saar. Since 2004 he has consulted at several estates, both in Germany and abroad, and has enjoyed high praise for his wines in the national and international press. 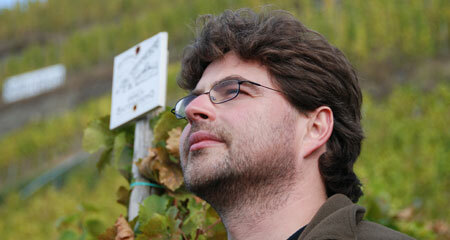 In 2009 Gernot assumed responsibility for the direction and the winemaking at Weingut Immich-Batterieberg. He stands for a powerful, sometimes somewhat wild, “unstyled’ style of Riesling (cultured yeasts are renounced for all wines), more on the dry side, and as a rule not intended for immediate consumption. Gernot is assisted by Karl Höhlein, who came to Enkirch from Zella-Mehlis in Thuringia. 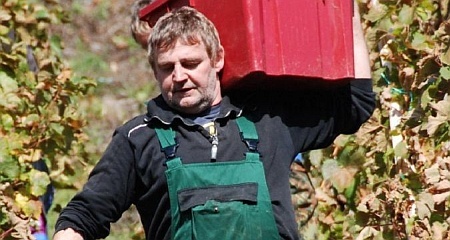 Trained as a toolmaker, loaded with musical ambition and gastronomic experience, he now works the estate’s extremely steep slopes with both passion and expertise, in addition to lending a hand with sales. What vintage am I interested in today-powerfully warming, playfully mineral-driven, or viscous and ripe? How are the 1998s showing? Or the 2003s? What about the 1973s? For experienced wine lovers, the pleasure of the vintage game is second only to the wine itself.It is in the vintage that the heart of the wine beats. It decides the expression: lightness or weight, coolness or warmth, strength or softness, gracefulness or rusticity, transience or longevity. In all cases, these are subject to the conditions of site, grape variety, and winemaking methods!In the vintage lies hidden the variation that separates artisanal wines from mass-produced wine, the curiosity that every year allows us to await with excitement the first must and then the first fully fermented wine, the pleasure of observing the changes as the wine ripens in the bottle. We have no interest in leveling out those differences, neither with regard to the contents, through technical attempts at manipulation (our wines, of course, are never chaptalized, concentrated, or de-acidified) nor with information, by way of concealment of the vintage or minimization of the vintage’s influence.Every year you will get from us wines which document the history of their creation and can tell us something of frost, heat, flowering, rain, harvest, and decisions both good and bad…We want to document our pleasure and our interest in authenticity and variation with a particularly notable representation of the vintage on our label. Each vintage will get its own color, which we believe (fully aware of the limits of such associations) represents particularly well a given year’s character.